Train enthusiasts, the new Railway Express collection from Kanvas is rolling your way! 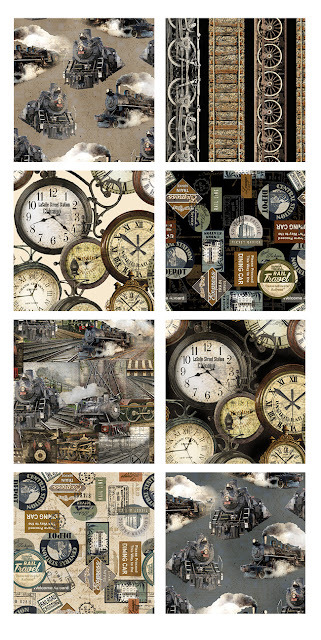 The vintage-style prints in this line include steam engines, clocks, station signage, and a one-of-a-kind railbed and wheel stripe. So much intricate detail, so much nostalgia! Pair the Railway Express prints with our rich Burlap blenders--a perfect match! Click here to see the Railway Express collection. Click here to see the Burlap collection. This collection could roll right into my house and stay. I used to ride the trains a lot when I was a little girl. In our part of the country, they are almost extinct. My ears always perk up when I hear the whistle blow. Trains are always a favorite around here. The guys will love this line! !